Susan and I are just a few days back from our first vacation in one of the "biggies" of US National parks. We've been fortunate to live in some beautiful places - New England, with its forests, mountains and shorelines...Chester County, Pennsylvania, with rolling farmland, Seattle, with its vibrancy and diverse landscapes, and here in North Carolina, with the Blue Ridge Mountains and Parkway to our west, the Outer Banks to our east. Yet, there was something unique, special, spiritual about Yellowstone and the Tetons. It was the magnitude - the space - the dimensions of it all. I suspect - I hope - we will return to them some day, because the 9 days we spent there were only a nibble, really. Lots of pictures and few words will probably work best for sharing our impressions....one from each day. 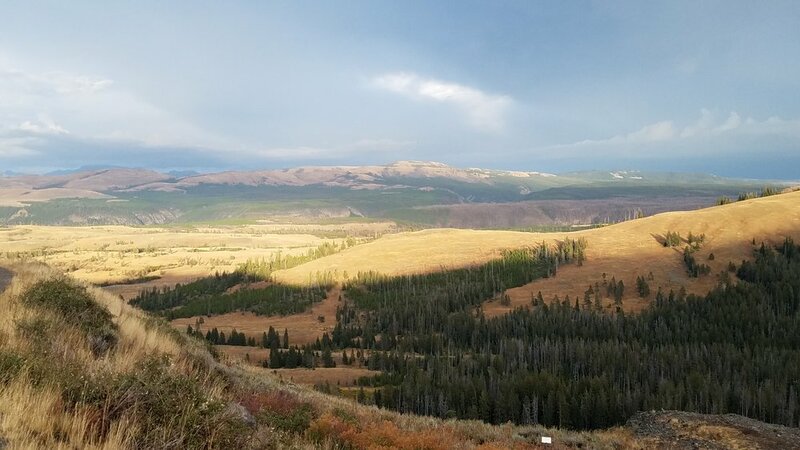 We found that the Cooke City home base allowed us to begin and end each day with a drive through our favorite part, the Lamar Valley. The Norris Geyser basin was simply inconceivable, surely like nowhere else on earth. The Lamar Valley meant frequent bison sightings...and occasionally, a mid road bison parade. Surprise snowfall led to a magical hike near the Mammoth Springs. Approaching the amazing Laurence Rockefeller visitor center, a magnificent hiking environment (the "beware of bear" signs perfectly appropriate reminders that we are visitors in their home). Sunset overlooking our Victor, Idaho airbnb back yard.